SeaTrek’s very own Captain Angie was recently featured by GoAbroad.com. In this article, Angie talks about travel tips, working for SeaTrek, and much more! Learn more about Angie below. While earning a B.S. in Biology at Colorado State University, Angie spent two semesters studying marine biology, anthropology, and conservation in Australia and Belize. After working in experiential science education, Angie earned her Teaching Credential and M.A. in Teaching from UC-Irvine. In 2007, she became part of the SeaTrek family and a National Science Foundation GK-12 Fellow while earning her M.S. degree in Earth and Environmental Science at Indiana University where her research focused on algal ecology and water quality. Since 2010 she has worked with the National Geographic Society as a curriculum writer/reviewer. In 2014 she was hired as an adjunct faculty member with Indiana University Purdue University-Indianapolis and developed a Coastal Environments & Sustainability field course in the Virgin Islands. What is your favorite part of your role as the Director of Marine Science, a Scuba Instructor, and the Digital Marketing Manager? My favorite part of the job is interacting with, teaching, and learning from my students and fellow staff members. This two-way exchange is the best part of my job, as is experiencing things that may now be familiar to me in a new way through the eyes and experiences of my students and staff. It’s very hard work but the most rewarding work I’ve ever done. I love sharing my passion for the ocean, environment, travel, and learning with others. I can’t believe I get paid to do what I love! And, it’s always different depending on the students you are working with. Being a scuba instructor is super rewarding because I help others access the underwater environment that we all love so much – and I hope to teach them the importance of conservation and taking care of it. What are some current projects you are working on? We are redesigning the SeaTrek BVI website to be more user-friendly, engaging and visually appealing. We will incorporate more images and video and integrate across digital marketing and social media platforms. What advice would you tell your pre-travel self? Keep your expectations realistic and try to live in the present moment. Go with the flow but also be proactive in your preparation. Always have a contingency for the contingency. What makes SeaTrek BVI special? 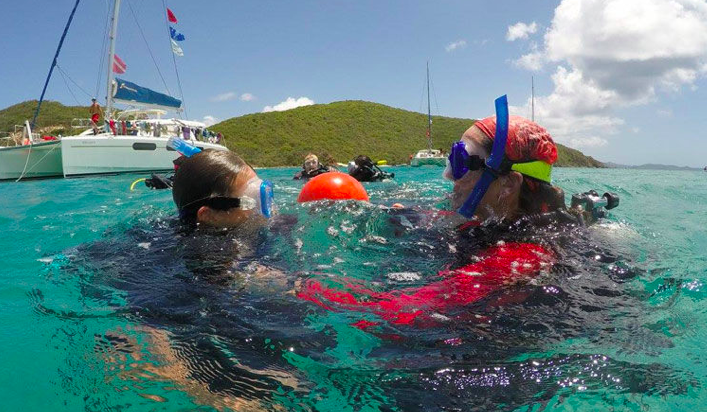 Our scuba camp, sail training, and marine biology instruction is second to none. NAUI employs a student-friendly teaching method that encourages new divers to build confidence and achieve above and beyond the required skill sets. Why should someone choose SeaTrek BVI over competitors? With an emphasis on safety, education, and mutual respect, our students and staff form unbelievable bonds as they work, live, sail, and dive together. Separated by age, we take up to four boats and 48 participants at a time. We keep our class sizes small, limit the number of boats, and provide excellent supervision by our experienced staff, most of whom have come up through the SeaTrek ranks themselves. This approach creates a home-away-from-home atmosphere out on the water. What makes SeaTrek BVI easy to market to potential participants? Whether you’re interested in scuba diving, sailing, marine science, or an all-around summer program, you’ve come to the right spot! SeaTrek offers tropical adventure summer camp programs for junior high through college-aged students. We sail around the British Virgin Islands and other islands throughout the Caribbean. Get ready for a new level of excitement and learning. Tap into your undiscovered potential. Learn more about the world and yourself than you ever dreamed possible. What are you waiting for? Join us for the ultimate Summer Camp at Sea! If you could participate on one of SeaTrek’s programs, where would you go and what would you do? I would do the Leeward Islands Explorer Voyage because it is true adventure with no set itinerary! You get to some isolated places that others rarely get to experience. Why is it important for people to travel abroad and experience new cultures? It opens you up to new ideas and helps you overcome fears. Young people especially need these opportunities to build their confidence, explore their goals, and reach their full potential. What advice do you have for individuals thinking about going abroad? Do it! You will learn more about the world, but even more about yourself. You will become inspired to carry that learning over to other parts of your life and your future. What does meaningful travel mean to you? Travel that goes beyond simply being a tourist and coming in and out of a place for a very brief time. Travel that involves intention and engagement with the local people and places – and creates the types of experiences that are authentic, that you will carry with you forever. What does ethical global engagement mean to you? It means traveling and experiencing other cultures with intention and authentic engagement. It sees the commonalities we all share more than the differences. Are there any developments with SeaTrek BVI that you would like to share with us?